Lemon and chicken go together better than peas and carrots. Don't believe us? Try any of the recipes below and we promise you won't see any sour faces at the dinner table. If you're looking for easy but super flavorful, this is it. We used chicken drumsticks for this recipe, but you could also use breasts or thighs. But no matter what cut you use, it will be even more delicious dunked in our Roasted Garlic Yogurt Everything Sauce. A favorite for Sunday night meal prep, try ramping up your lunch or dinner game by batch cooking this zesty combo of grains, veggies, and lemony marinated chicken. A comforting take on sweet-and-sour soup, this soothing and detoxifying soup really does soothe the soul. One way to add a ton of lemon flavor without all the lemon squeezing is to use lemongrass paste. It tastes exponentially better than bottled lemon juice and has a shelf-life that out lives lemons by a long shot. The marinade on this chicken is worth the 2-hour wait. It's a combination of white wine, lemon, olive oil, and herbs, and it will definitely change the way you grill chicken. If you've invested in an Instant Pot, this is the lemon chicken recipe for you. All you need are four simple ingredients plus water and you'll have a whole cooked chicken an an hour. 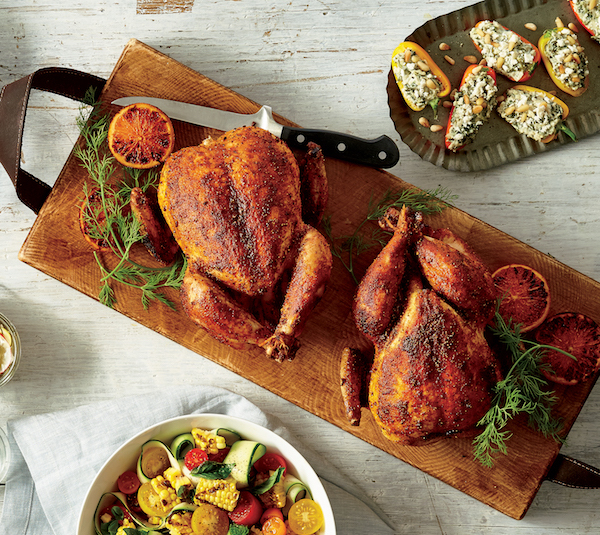 How to grill a whole chicken: Rub with herb butter, stuff with lemon, and grill. Low carb lovers, this one's for you. Actually, it's pretty much for anyone who likes delicious lemony chicken. It's marinated in a lemon-zest infused yogurt before getting baked and served over veggie noodles.